the frame section measures 22 x 17cm and the photo section are 14 x 9 cm. 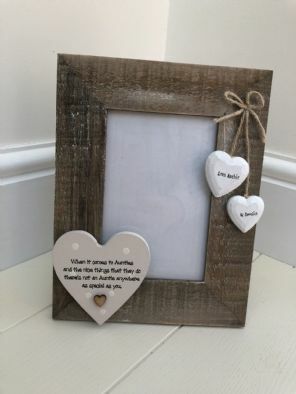 This can be made with any wording of your choice providing it fits! I.Eapproximately the same amount of words that is shown on the item. PLEASE ALSO MAKE CLEAR ANDDOUBLE CHECK THE TEXT THAT YOU SEND US, AS WE CAN NOT BE HELD RESPONSIBLE FORANY TYPO'S / SPELLING OR GRAMMAR MISTAKES THAT WE ARE SENT. THE WORDING THATYOU SEND WILL BE THE EXACT WORDING THAT YOU RECEIVE. 24 HOURS OF YOUR PURCHASE, THEITEMS WILL BE SENT WITH NO PERSONALISATION. SOMETIMES YOU MAY LIKE THE ITEMAS IT IS IN THE PHOTO AND WITHOUT ANY PERSONALISATION. IF THIS IS THE CASE, ITWOULD SPEED UP THE DESPATCH PROCESS FOR YOU IF YOU SEND US A QUICK EMAIL TOSTATE THIS. IT IS WHOLLY YOURRESPONSIBILITY TO SEND ANY DETAILS REGARDING YOUR PURCHASE WITHIN THE 24 HOURTIME FRAME, AS REGRETTABLY WE DO NOT HAVE THE TIME TO CONTACT EVERY INDIVIDUALCUSTOMER TO REQUEST THEIR REQUIREMENTS. BEFORE SENDING YOUR PAYMENT ANDWE WILL ADJUST THE POSTAGE COSTS BEFORE YOU PAY, AS THIS CAN NOT BE DONE AFTERPAYMENT IS RECEIVED. We always aim to send all goodswithin 1-2 working days from receiving payment and personalisation details.However at busy periods this is not always possible, so please allow 7-10 days.